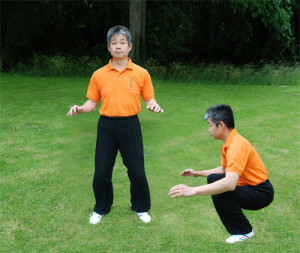 Practising Horse Stance can become quite addictive. Why is this? It is because the Qi flows very strongly and the feeling and sensations in the body. When we go to the Low Position we will find that we breathe very quickly. This is because we need more Qi to come in to support this physical training. Then we will feel warm and we can also sometimes feel the Qi rise from the Dantian丹田 and eventually it will go up to the Baihui point百會穴, but this takes a long time to reach this level. To open the Baihui point is not easy and requires very strong Qi. It is like a kettle, the water needs to be boiling before there is a lot of steam coming out of its spout. At the same time we can see things clearly because the Qi through our eyes. The Qi flows through the whole body, including the fingers. The Qi will also release out through the Laogong points劳宫穴 and the fingertips. When we change from the Low position to the High Position we can feel more sensations in our head and we have more saliva, some people might even feel light headed and a little dizzy. All these reactions are fine. We can also feel the old Qi releases out through our breathing and some people can even see the colour of their Qi. If you keep practising Horse Stance you will be healthy and discover more about your internal body through the strong flow of Qi.